PLEASE CLICK ON THE LINK AT THE BOTTOM OF THIS POST TO PURCHASE ONLINE TICKETS AT BROWNPAPER TICKETS. IF YOU ARE UNABLE TO USE THE LINK, PLEASE VISIT: http://www.brownpapertickets.com/. IN THE TOP RIGHT CORNER WHERE YOU SEE “ARTIST, CITY OR VENUE” TYPE “CLINTON HILL GARDEN WALK”. ONCE THE EVENT APPEARS, PLEASE CLICK ON THE BLUE GREEN EVENT TITLE TO OPEN. ONCE THE EVENT PAGE OPENS, CLICK ON THE ORANGE BOX MARKED “BEGIN ORDER”. ON THE DAY OF THE GARDEN WALK, pick-up a self-guided map on the corner of Washington & Lafayette, just outside the entrance to the G train, and take the opportunity to enter into private neighborhood gardens. See you on June 6th! I would like to invite you to friend us at Facebook. The link can be found at the bottom of this page. We post lots of great information daily about gardening, urban farming, local food awareness, environmental art and neighborhood events in Fort Greene, Clinton Hill, and Prospect Heights. The self-guided Fort Greene Garden Walk on Sunday, June 14th, 2009 from 11am – 5pm includes 10 private gardens, 3 community gardens and a commercial rooftop, featuring a hydroponic garden, a beehive and a chicken coop. Additional stops on the tour include Irondale Theatre (http://Irondale.org) and GreenSpaces (http://dawny.squarespace.com) where “green graffiti” artist Edina Tokadi (http://mosstika.com) has created indoor and outdoor installations with sedum and wheatgrass. Each year the BBGD presents the hidden domestic gardens of historic Fort Greene. One highlight of the 2009 tour is a backyard re-creation of a classical ruin. Inspired by Hadrian’s Villa, this gardener has combined two yards behind his Italianate brownstone. Architectural fragments, shards of masonry and sculpture, and mossy plaques suggest the pageantry of ancient Rome. Another stop is the garden of legendary jazz singer and long-time Fort Greene resident, Betty Carter. Throughout her esteemed career, Ms. Carter partnered with the genre’s greatest, including Miles Davis, Dizzy Gillespie, Charlie Parker and fellow Fort Greene resident Sonny Rollins. A weeping cherry tree planted and tended by the singer forms the focal point of this garden. Other highlights include a triple lot with multiple plantings and a separate vegetable garden, the wild and woody private garden of the New York Mycological Society’s founder, a handsome stone landscape with a sunken pool, and a showcase garden, designed for entertaining, by the talented owners of Plant Specialists, one of New York’s top landscape design teams. In addition, John Howe of the Brooklyn Bee (http://thebrooklynbee.com) will be on hand with his bee kit, the Sankofa Art Center will showcase birdbaths made at its Fort Greene pottery collective, and Alive Structures (http://alivestructures.com), a local business that creates green roofs and walls and planters from recycled materials will display its wares. All ticket holders must visit Greene Grape/Provisions on the day of the tour for a copy of the map. 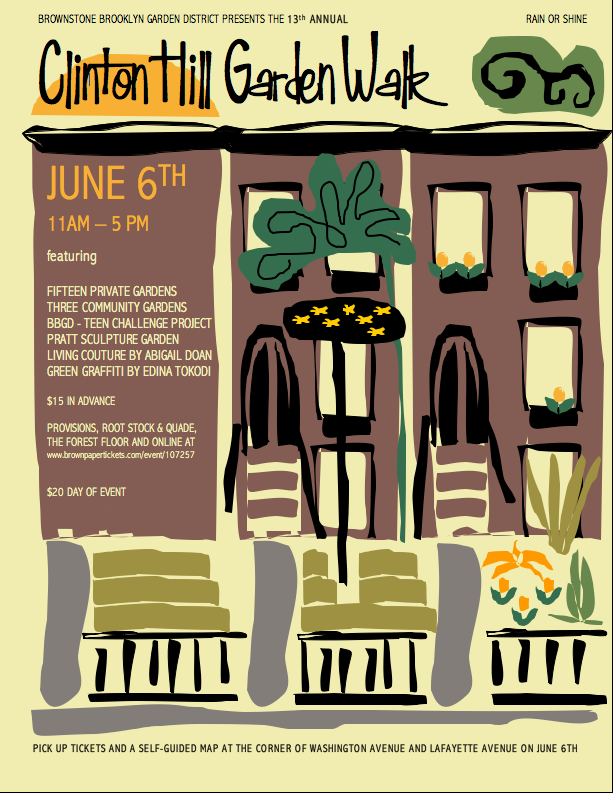 On Sunday, June 14th from 11AM – 5PM, enjoy a self-guided Garden Walk through private and community gardens in historic Fort Greene, Clinton Hill and Prospect Heights. This event draws attention to the singular qualities of the neighborhoods’ private and community gardens, providing an opportunity to view hidden horticultural treasures and to meet their inspired creators. 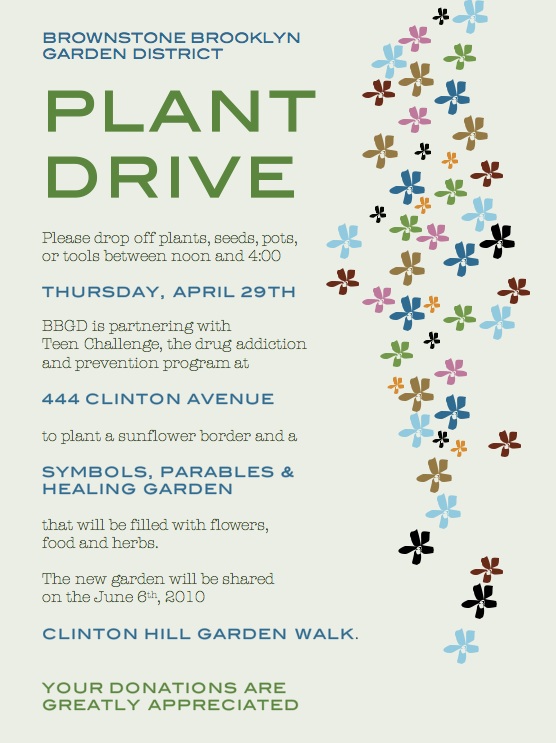 Proceeds from the Walk support the annual Fall Bulb Give-Away providing thousands of Spring flowering bulbs, free of charge, to residents of these three communities, encouraging the continued beautification of the Brownstone Brooklyn Garden District. We are looking for extraordinary gardens in Fort Greene, Clinton Hill and Prospect Heights to be featured on the BBGD 12th Annual Garden Walk. The walk will take place on June 14th from 11-5. NOTE: A garden sitter will be assigned. Share your green. Increase your plant variety without exhausting your budget. BBGD will be celebrating at 753 Fulton Street.